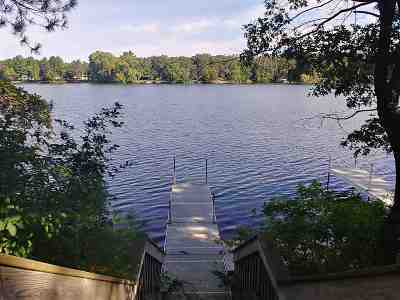 Beautifully maintained lake house with 100' of frontage on Big Roche-A-Cri Lake. 217 acres perfect for water skiing, fishing, swimming or whatever. This cozy Terrace home has 3 bedrooms and a guest suite. Deck was freshly painted and has a new roof (2 years old) Home has 4 br septic system and has been approved to add a 2nd floor if desired. Pier is included. Enjoy the open concept kitchen, dining & living room with a stone woodburning fireplace. Has Nest thermostat for remote control no matter where you are. Wired for alarm system and most furniture is included. Now is the time to start making memories. Items Included: Stove, Refrigerator, Microwave, Water Softener, Various Tools And Housewares.